Don't even have a full gusset yet. But.. well does it really matter? The stroller was brown and green, the matching blanket, green and white.. And there were other green and brown, and taupe gifts. What can I say? Great minds think alike! And all the while the snow is coming down—so fast that the roads were slushy. I left early—but not early enough—The roads were better--(the worst of tree limbs were pulled to side) but visibility was bad—and the heavy wet snow covered everything—road signs were unreadable. I ended up taking a detour of a few miles to find the entrance to the highway. The best was the roads got better as I once again headed south. Scarsdale ended up, all said and done with 10 inches of heavy wet snow—Queens had under 2—90% of which was melted –since Queens was a bit warmer (we never fell below 33°--and 1 degree is enough! Things melted (albeit slowly) and roadways were wet, but not slushy. The sidewalks were slushy—but (knock wood) I didn't even slip! So what little knitting I got done—got done yesterday at Panera's—I was busy in the AM—and afterwards visited a bit with a friend—so it was almost 8 by the time I got home. I just didn't get any knitting done after dinner, either. A busy weekend, but not much to show for it! The post below was ready to go yesterday—all I needed was the photo's—and when I went to take them— I discovered the men cleaning the ceiling of the terrace (as part of the painting prep work) hadn't protected the the window/door frame to the terrace and the high powered stream of water had leaked –and my floor was wet—so instead of taking photos, I was busy mopping and moving things. But not yet gusseted! And, of course, as is the way with flapped/turned/gusseted heels, the stripe pattern on the instep is “broken” No matter. The flap (as I like them) is a few rows deeper than convention (these socks are 64 stitches—a good number for a 4 stitch rib pattern to work symmetrically) and the flap should be 32 rows long (16 chains on each side and 16 (+1) pick ups on each side for the gusset.. but my flap is 34 rows deep, and 18 (+1) stitches picked up. 19 + 19. This will make the gussets an extra 3 rounds long. 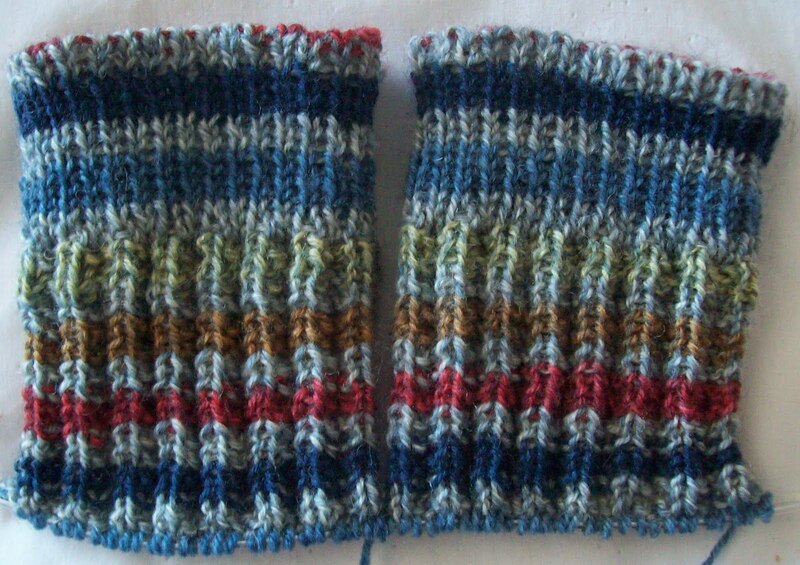 It always seems forever to knit the gussets—all those extra stitches in every round—but because its also longer-- When I am done with the gussets a good part of the foot is also knit. 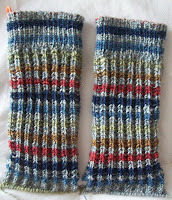 I have the weekend and Monday to finish these—I think they will come in right at the wire. Oh—and the hat—all done—knit and finished. Today I'll buy some ribbon and wrapping paper to get it all packed up and ready for the shower tomorrow. Yet. But the complex border is done and nicely, (not perfectly, but nicely) grafted. The rest of the hat will be ribbing—to create the maximum of wear. Baby's heads (well, normal baby's) start out small (my baby's had big heads from the get-go) and grow—FAST! 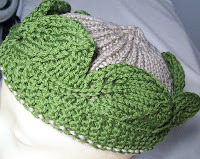 Ribbing will let a hat fit (unstretched) on a new born, and then stretch out to fit 3months later. 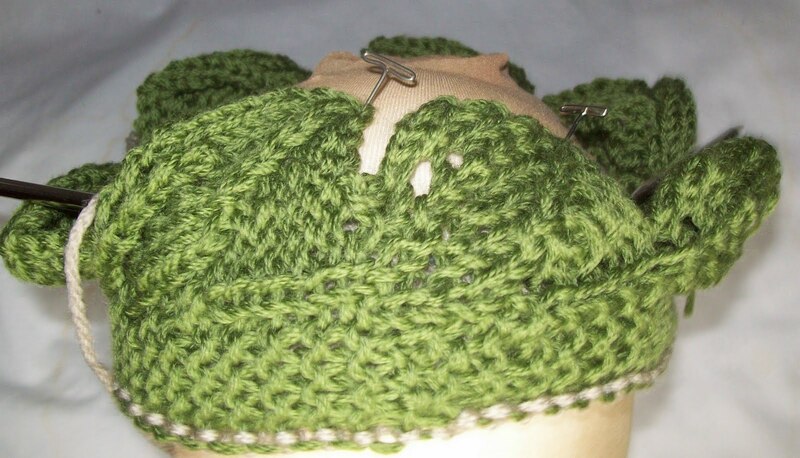 (There is about 1 inch of unseen ribbing behind the leafy border) The hat easily stretches onto Head--(about 19 inches)--so it should fit for a few months. I'll finish it today—and get back to the heel flap and get the heel of the Rag Effects socks done, too. And once the heel is done—it seems no time at all till the sock is finished! Not today—well, not finished with the socks today) but the hat will be finished. 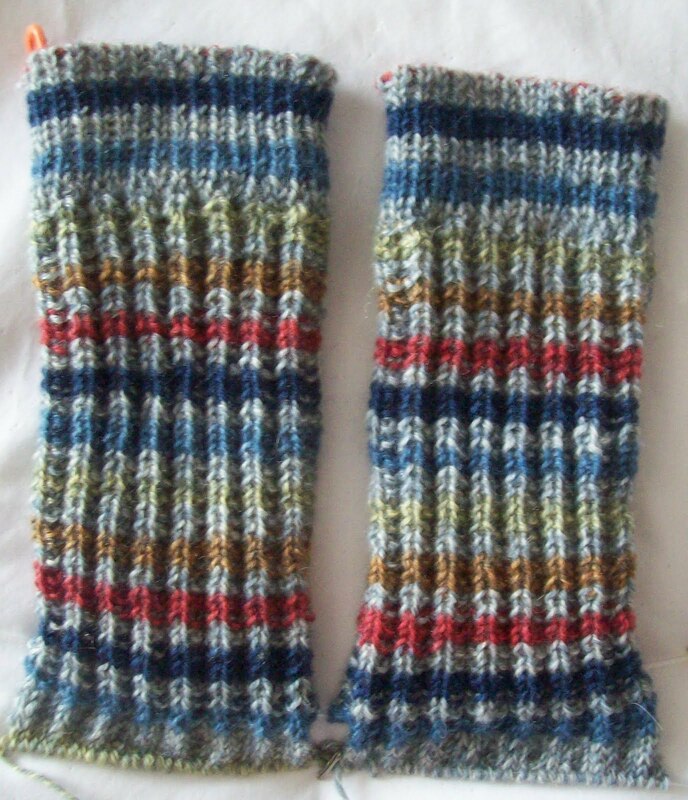 I'll get some knitting done today—If for no other reason than I want to finish theses socks this month! And time is quickly running out! Reading and cleaning, and cooking (and this morning, already, shopping) have eaten into my knitting time. Yesterday—NOTHING! Not a single stitch of sock was knit. But—my refrigerator is clean, and dishes were loaded into the dishwasher, and the same put away later, clean! This AM I went out to breakfast—and afterwards-- a quick stop at Trader Joe's—where I stocked up on oatmeal. The price has gone up (isn't that true of everything?! )But at $3.29 for a 30 ounce canister, they are half the price of all the competitors. (I bought 2 canisters. It's not quite a 2 month supply—my local Trader Joe's has such a horrid parking lot I tend to avoid going--but enough to keep me in oatmeal (irish/steel cut style) for a while. It's noisy today—the terrace ceilings are being power sanded—the last steps of refinishing them will be clean up and painting—Both the ceiling and the floor. Then the new railing go in—all this (hopefully) before the weather turns too cold and wet to be doing outdoor work. Already its been rainy enough that the work is behind schedule—and quiet rainy week days are punctuated by noisy “catch up' week ends. Tomorrow—more rain. It's already been the wettest year on record (or near to) and there is still 3 months of the year to go. I hope there are more cold, wet, windy days (as predicted for tomorrow)--which bad as they are, are better than mountains of snow! 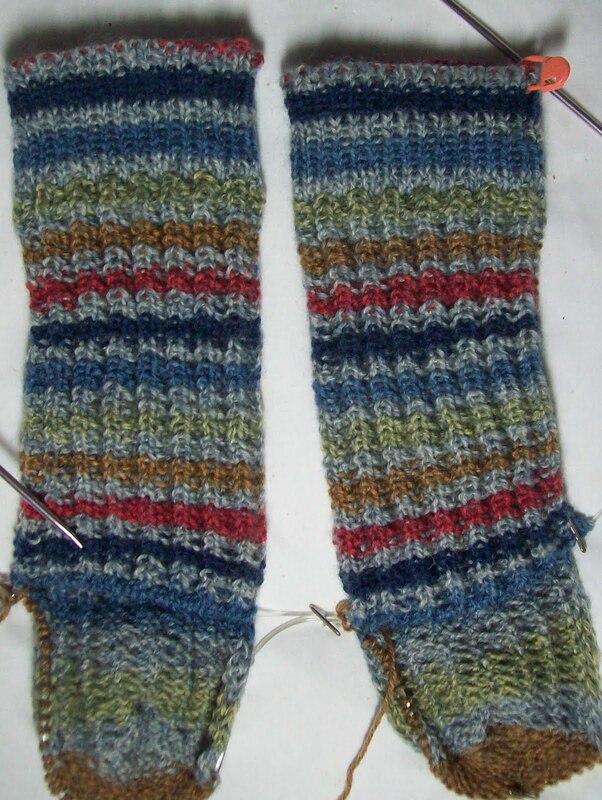 Crazy 8's put aside and new simple socks started—Patons Ragg Effects—in a simple stripe pattern. Nothing done but the cast on and a few rounds (not even a half inch!) but this is the perfect yarn—every few rounds (before I get bored or distracted) a new color—The grey is a bluish grey (the color of very faded denim) the other colors (red, dr. blue, lt. blue, gold, green) are nice enough. This will be a basic go with almost anything sock. A simple no brainer, generic sock. I still haven't decided on a stitch pattern—I am thinking about a rib—3 X 1—but I've done that before. Maybe a broken rib, or deeply textured rib. I have time to decide--I tend to like a nice deep (1.5 inch) cuff—and I have a number of rounds to do before I have to decide. Later today I MUST catch up on laundry—every day I have used a fresh clean towel as a 'drape'/work cloth for cleaning and dressing the wound—10 days later, I have a full load of towels alone to wash! Plus there are clothes—this time of the year is the worst—2 week ago there were 80° (and warmer) days—now day time temps are in the 60° (about 16° to 18°C.). I think it's finally time to move the sleeveless tops and dresses to the back closet, and bring out the long sleeves tops (and light jackets)--and soon enough, winter blankets, too. And I have resolved—Saturday is for SEWING! I want to get some skirts made—I have the fabric (denim, and twills—Since January!) and I have a pattern, and I always have thread, and other notions. All that is needed is the gumption and drive to turn the fabric into new clothes. Is slow(too slow!) but steady—Doctors appointments—and anxiety about them (2—one Tuesday, one Wednesday) is past. The lanced infection is still an open draining wound—and will continue to be for a while. There is, still the new daily routine of cleaning and dressing. There is marked improvement--(and one sure sign—itchness! )in appearance. The next follow up is in 2 week. Nothing has been done on the crazy 8 socks—they might be put aside till next month—I think they are just to much to cope with now—There are just too many changes going on in my life right now—if I were angry (or scared—or very scared) complex knitting would be a good distraction. But I am just a bit overwhelmed—and complex knitting is just another chore. I have lots of self striping yarns—I think its time for something dead simple—something to just knit and not think about for a while. Even reading is going slow—I am only about half finished a book I started a week ago—and that's slow for me. With all my introsection, and self centered concern about my health (and continued health with out insurance!) I don't feel I have anything to write about—and nothing to show either. Maybe tomorrow will be different! --Actually I know it will be—I just hope in a more visible positive way! Is good news? Well, it's boring. I picked up the bag of yarns I've collected for the Crazy 8 socks—but I didn't actually do anything. Maybe today. Health-wise, my infection/wound is healing up nicely—though antibiotic are playing havoc with my digestion—Some probiotics are the next order of business—I need to replenish all the good bugs that normally live in my digestive track, and I don't think there is enough yogurt in world to do that! 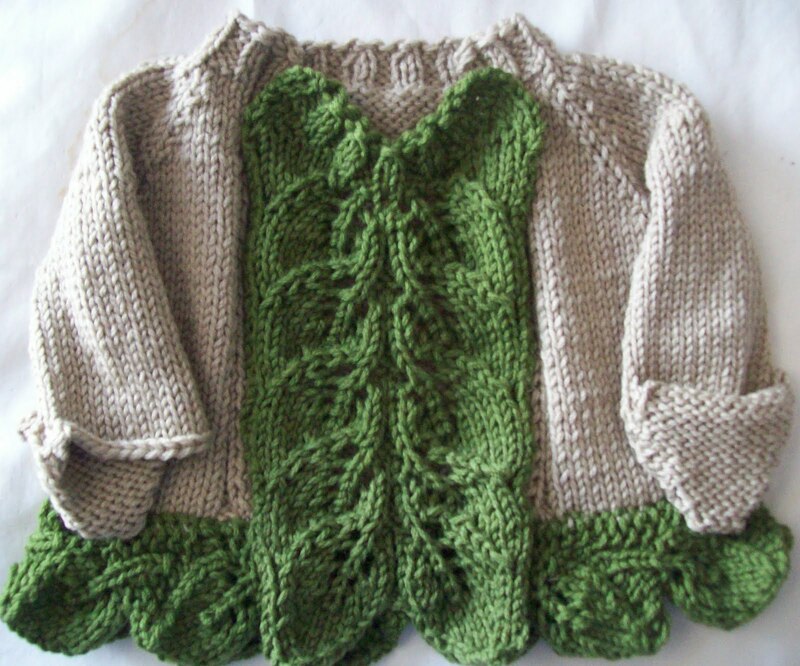 My DIL-Sonya—is a fiber artist—and she has a collective project going on—A simple one—quick and easy to knit—it only needs a few yards of yarn. 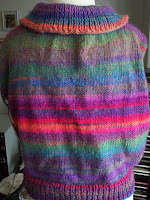 All the details can be found on this blog—and you can also follow her on FaceBook or on Ravelry (her group) Why don't you join in? I will be—I have a few yards of a lovely shell pink-too much yarn to discard—but too little to do almost anything else with. Have changed! I still haven't gotten back to my normal routine (it's day three! )And in reality, I never will. But I am on my way to getting some new routines in place. Number 1 priority (that's being met!) is oral antibiotics-4 times a day (as near as to every 6 hours as I can manage!--so for I've never been more than 20 minutes late)--and next priority is changing the dressing on the 'wound'--The good news is: every day is less ugly looking—it's changing, slowly but surely, becoming pink and healthy looking (and I am getting better at doing it!) There are other medical priorities; scheduling a follow up to surgery, and other stuff. Like getting some tape—I came home with 99% of the supplies needed to change the dressing—everything but tape! I've been to the local drug store twice now and forgotten to get tape twice!--I have a few inches left—but I can't forget again today! A distraction to knitting is a book—I can't manage to read and knit at the same time. And then there is the “bad news comes in 3's”--I am on the mend—but 2 good friends have been ill at the same time –One painfully so—A cracked molar (and emergency root canal) and one seriously so—with cardiac and kidney problems (both high blood pressure related). Prayer (good) and worry (bad) about both of them is distracting me, too. So.... Let's change the subject! When I was in the hospital—my daughter put together a small goodies bag—a hair brush (vital!) some hand cream (not really needed), and other toiletries. 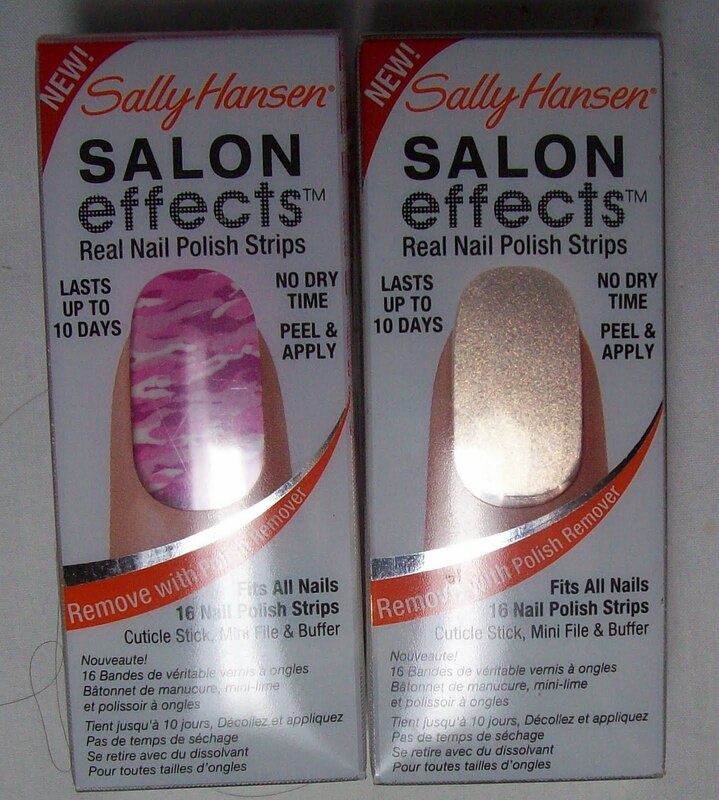 The best was she tucked in one of these –something totally new to me—Sally Hanson's Salon Effects--a Peel, Place and Press on NAIL Polish! I was a bit incredulous—but now, I am a believer! It's not cheap –each box is a single use application and cost about $10—but I was able to give my self the of the best manicures ever! 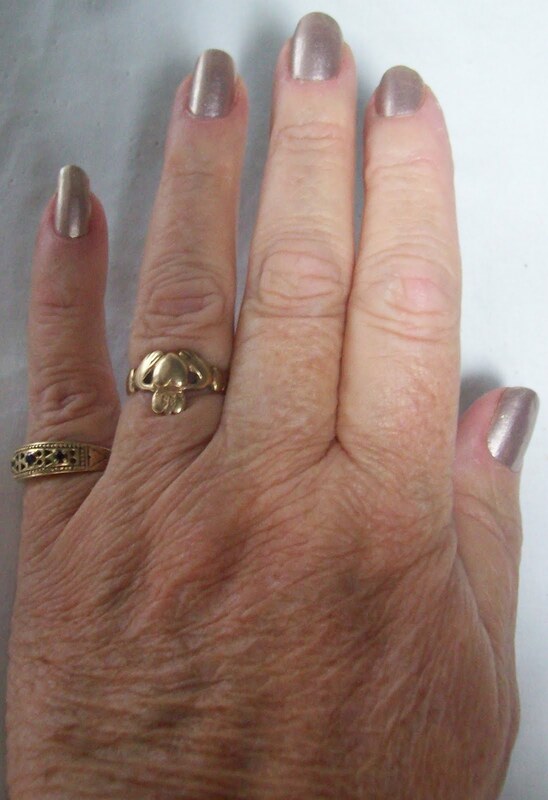 Still it's cheaper than a salon manicure. First, it's almost odorless—a major plus. Second, it's not that hard to get smooth and even. It's a bit tricky—but I managed to do it in a hospital bed, with an IV line in my wrist (which limited my hand mobility)--and got the left hand done (easy! 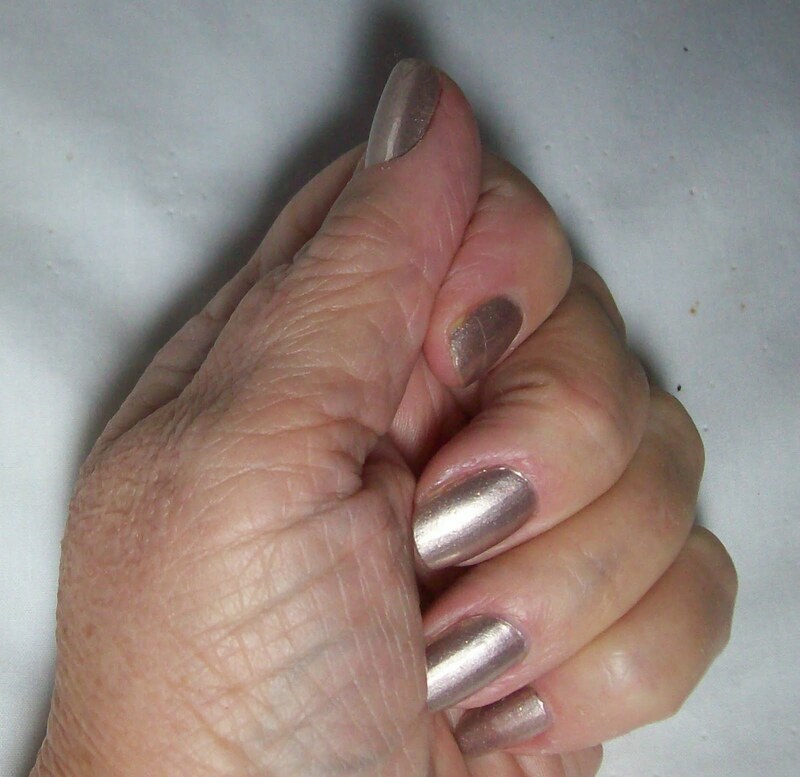 I am right handed) first—but also got the right hand done—Not perfectly—but infinitely better than I have ever been able to with liquid polish. Thirdly--no drying time--it goes on dry! No spills, no unevenness, no smell--these alone make it a good product, But! here it is 4 days later—looking pretty damn good!--So it's durable too! So far, no chips, no peeled edges; It's holding up way better than average. I know I am not the last person to have discovered this product--and that to many this will be old news. I don't often use my blog to do product plugs (especially free one!) 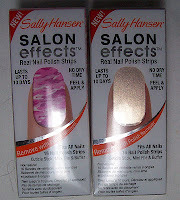 but this is a product that impressed me. 4 days of IV antibiotics and minor surgical procedure (lancing and draining the infection) and now i am home. Still on antibiotics, and all sort of other stuff. 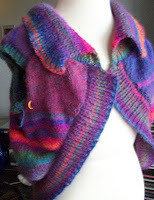 But I got some knitting done--tomorrow a photo of a FO! Thank's again for you kind thoughts. Laid low with an infections... Hopefully on the mend, and will be back to blogging soon..